We've been dairy-free by the way of cow's milk for nearly two months now and there have been some remarkable and notable changes to some our health. By and by, we are very healthy, save for minor issues. Some of us have had consistent and chronic urinary tract issues. But I noticed a few weeks ago that this member (identification purposefully omitted) was no longer experiencing these issues and the last experience was right around the time we removed cow's milk from our mainstream diet. A bit of history...I knew the re-occurring issue had to do with bad bacteria and had given a good amount of probiotics - 3 teaspoons of holistic, high quality probiotic daily - to combat the problem. After a week of this regimen, under my supervision, the issue went away completely. However, it would the regimen wasn't adhered to and naturally the problem continued to happen. Never did it occur to me that milk was the cause of the issue to begin with in the first place. There were no other tell tale signs alerting me to a reaction to cow's milk. If it wasn't for our intentional, permanent fasting from cow, I would probably have not figured it out. My holistic journey has been a wonderful, empowering, eye-opening experience. My goal is prepare and feed WHOLE intact real food. Little by little, with every bit of change. If you want to move towards a more wholistic/holistic lifestyle, start with small changes. Start with the basics such as salt, oils and flour and learn how they are processed etc. Anyhoo, we are LOVING hemp milk as a replacement! It is unbelievably versatile and as easy to make as a smoothie in the morning. What intrigued me the most was the fact that curcumin has been shown to heal the gut and support the growth of good probiotics. (2) Upon learning that, I added two dashes of powered Turmeric in a glass of water and found it very soothing. 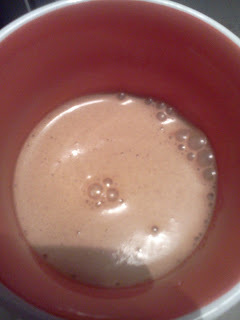 So I added it to my daily chocolate hemp milk. A cup and a half of Raw Protein Hemp Milk. You can find the recipe here. 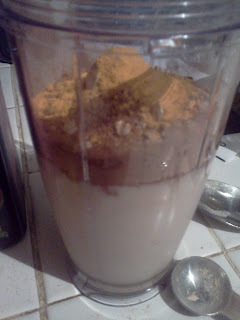 1 tablespoon of Miessence Complete Protein Powder to make it a protein shake. 3 tsp of cocoa powder. This can be replaced with raw cacao powder. A dash or two of pumpkin pie spice. A pinch of pink salt. Two dashes of tumeric or 1/8th to 1/4th of a teaspoon. 1/2 teaspoon of vanilla extract. I used my red raspberry tincture. To make your own tinctures go here. Blend in a blender or shake in a shaker jar. Blender works best. Add all ingredients in a blender or shaker jar. 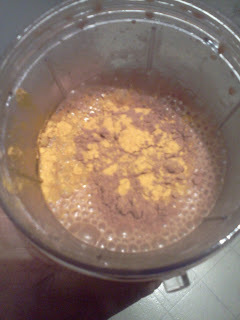 Gorgeous Turmeric Mingling With Cocoa! All Blended! Foamy Frothy Goodness! Enjoy! Leave a comment if you made this at home. This recipe is my own, please credit theoliveparent.com if sharing. Please read the disclaimer/disclosure policy.